This lovely chili prawns recipe is served over a fresh mango salad with onions, red chili and bean sprouts in a Thai flavored vinaigrette. It is a wonderful dinner or lunch recipe on its own, but you can also use it as part of a Thai meal. See below the recipe for some meal suggestions. Prawns are really just another word for large shrimp. Technically prawns are a slightly different crustacean, but for all intents and purposes you can use them interchangeably and most of us can’t tell one from the other. If you like Asian flavors, give this prawn recipe a try. I think you will really like it. Of course, Asian sauces often have a bit of sugar in them. Omit it if you prefer or use a sugar substitute to keep the sweet flavor without the sugar. Place ingredients for the mango salad in a medium bowl and toss to combine gently. Set aside. Shell and devein the prawns, leaving the tails intact. Combine the ground turmeric, chili, paprika and garlic in a large bowl, add the prawns and toss to coat them in the chili mixture. Cook the prawns, in batches on a heated oiled grill plate (or grill, barbecue or saute pan) until lightly browned. 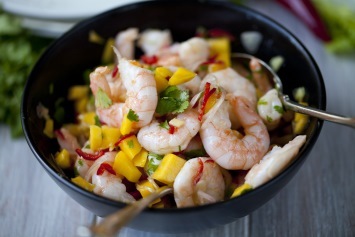 Serve the prawns with the mango salad. Serves 4 to 6 (nutritional analysis based on 4 servings). I like to scatter the prawns over the mango salad. The warm prawns over the cool mangoes and vegetables make a fabulous combination. It’s a favorite lunch or easy dinner recipe. You can use regular or brown sugar if you can’t find palm sugar, but of course it will taste slightly different. You can also use a sugar replacement like stevia, a naturally sweet plant that is safe to consume and actually healthy for you. This recipe is gluten free. Most fish sauce is naturally gluten free but you may want to make sure if you are extremely intolerant of gluten. Note that the cholesterol is from the shrimp which are pretty healthy, the carb count is mostly because of the natural sugar in the mangoes. You can eat this wonderful prawns recipe as a meal on its own or as part of a larger Thai flavored meal. Try serving it with soba noodle salad for a cold meal, or hot Thai noodles or pad Thai. You will find all of our Asian flavored recipes here.